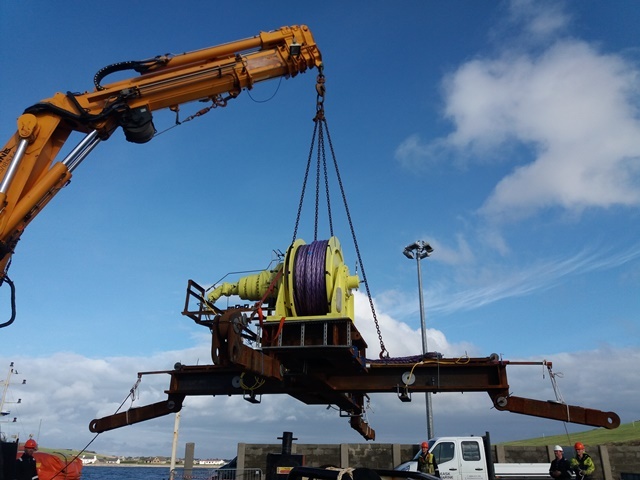 In preparation for CorPower’s C3 Wave Energy Converter (WEC) deployment at the European Marine Energy Centre’s (EMEC) Scapa Flow site in Orkney, CorPower and marine operator Leask Marine have successfully completed installation of a bottom-based foundation module. The module provides force reference from the WEC to the seabed and includes a mooring system with tidal adjustment function and tensioning capacity up to 60 tons. 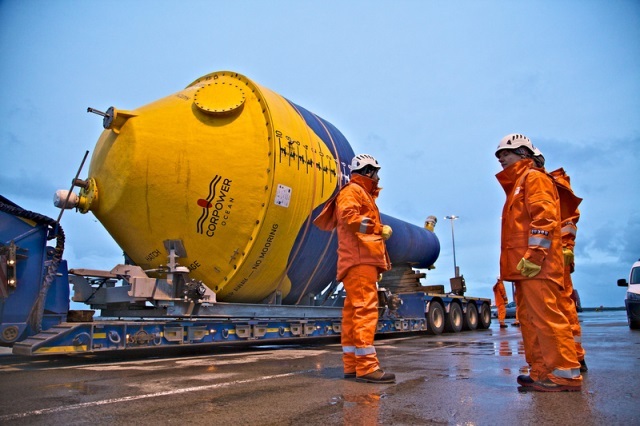 The installation operation included the subsea attachment of the foundation frame to a pre-laid gravity base, and the laying of an umbilical cable which controls the tidal adjustment unit. Leask Marine’s C-Odyssey multicat vessel was used for the installation, with a dive team assisting the subsea activity. The CorPower C3 WEC has, after a rigorous dry test program in Stockholm, been delivered to a workshop in Kirkwall, Orkney. The device is currently undergoing final checks, with installation and on-site commissioning at the Scapa Flow site expected in early 2018. CorPower follows a structured five-stage verification process established as best practices for ocean energy technology by ETIP Ocean and Wave Energy Scotland. It involves step-wise validation of survivability, performance, reliability and economics starting with small scale prototypes in Stage 1, continued by sub-system testing and then fully integrated WECs in increasing scales up to array demonstration in Stage 5. The current Stage 3 program follows the prior testing of multiple prototypes in smaller scales performed in Portugal, France and Sweden since 2013. Stage 3 demonstration is supported by best practice from EMEC in Orkney, alongside the experience from offshore power generation company Iberdrola Engineering and EDP, the University of Edinburgh and WavEC Offshore Renewables’ expertise in cost and performance modelling. €6.5 million has been invested in the Stage 3 program by InnoEnergy, the Swedish Energy Agency and Wave Energy Scotland, with another €4 million contributed by the European Commission’s H2020 WaveBoost project.